The TR 575 is a single tank system for mixing and transfer of sport surfacing products. The TR 575 is equipped with a dual diaphragm pumping system to draw coatings into the tank to prepare for addition of sand, water & pigments. A full-sweep, hydraulic agitation system mixes quickly and thoroughly before pumping the coatings into a sealer wheeler or directly onto the court surface. Tank cleanout and switching colors is quick and easy. The TR 575 can also be used for mixing and applying running track coatings or latexes. 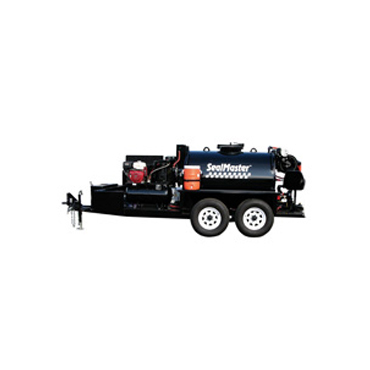 Machine includes a 75-foot hose and spray wand for spraying coatings with a spray tip. Coatings can also be pumped directly to the pavement surface by removing the spray tip and the end of the wand. P482A001 2” x 15’ hose with fittings 30 lbs. Single tank system for mixing and transfer of sport surfacing products. 75-foot hose and spray wand. Spray bar is optional. Two 6,000 lb. axles with electric brakes. Running lights and brake lights.